This is an Associated Press (AP) Photo — not mine. Four short years ago, Butler University basketball star Gordon Hayward was three inches away from producing one of the greatest moments in college basketball history. Unfortunately, as we all so vividly remember, the shot rimmed out, and soon thereafter, while eating dinner at Fazoli’s, Hayward informed his teammates that he was declaring for the NBA draft, after just two seasons with the Bulldogs. It was immediately reinforced as the the correct decision because he was made a lottery pick (9th overall) by the Utah Jazz. Hayward is now playing in his fifth season (on his second NBA contract), and he is doing exactly what we all thought he would be doing. Eleven games into the 2014-2015 season, Hayward is averaging 19.2 points, 5.5 rebounds, and 4.8 assists per game, with a player efficiency rating (PER) of 23.43 (15th best in the entire NBA). Of those drafted ahead of Hayward, only DeMarcus Cousins and John Wall are averaging more points per game (22.4 PPG and 19.4 PPG, respectively), and only Cousins, Derrick Favors, and Greg Monroe average more rebounds per game (at 11.1, 8.3, and 10.8, respectively) than the 6’8″ winger. Cousins, with a player efficiency rating of 27.21, is also the only player from the entire 2010 draft class with a higher PER than Hayward at this point in the season. Revisiting the draft class, Evan Turner (2nd overall, new team), Favors (3rd overall, new team), Wesley Johnson (4th overall, new team), Ekpe Udoh (6th overall, new team, plus zero games played this season), and Al-Farouq Aminu (8th overall, new team) were all picked ahead of Hayward back in 2010 and no longer provide value to the team that drafted them. Many of which because of their “upside” and the fact that they attended “big-time” college basketball programs that “better prepared” them for success in the NBA. What many scouts missed on Hayward is that he is one of the most naturally gifted athletes, who happens to also be really good at basketball. Hayward had grown, developed, and learned the game under one of the college game’s very best coaches, who, if you have not heard, is now the head coach of the legendary Boston Celtics. Immediately after Hayward, Paul George was selected by the Indiana Pacers, and if he had not suffered such a gruesome leg injury while playing with Team USA this past offseason, he was destined to stake his claim as one of the top five players in the NBA this season. Thus, it is safe to say that George is a player drafted after Hayward that has ended up more valuable to his NBA team, but he is the only one. Other than George, other notable first rounders picked after Hayward are Larry Sanders (15th), Eric Bledsoe (18th), and Avery Bradley (19th), who have all had good starts to their careers but have not been nearly as effective as Hayward. Most importantly, Hayward is having the time of his life as a 24-year-old in a league of professionals. His blog titled “THE BEST IN THE GAME” is a perfect representation of this. If you have not yet read it, I strongly suggest you checking it out as it is an article that nearly broke the Internet/Twitter when it was released. Most Butler fans knew Hayward was bound for success in the NBA, and just like his Bulldogs teams from 2008-2010, he flew under the national radar for quite some time before getting the attention he truly deserved. In the years to come, Hayward will continue to solidify his position as one of the best wing players in the league. Go Dawgs! On July 3, 2013, the Boston Celtics announced that they had hired Brad Stevens to become their next head coach–replacing Doc Rivers who presumably did not want to be part of the rebuilding process, and who can blame him? Rivers had coached a star-studded Celtics team from 2004 to 2013 and was fortunate enough to attain the ultimate goal (an NBA title) in 2008. However, with the team on the verge of trading long-time Celtics, Paul Pierce and Kevin Garnett, and subsequently going into full “rebuild mode,” it was time for Rivers to move on–which ultimately led to him being traded to the Los Angeles Clippers in exchange for a future first round pick. Thus, Boston had officially started a new chapter in its very long, very rich history. Their new hire had been an extremely successful coach (77.2 winning percentage) who led his team to two national championship games. The “problem” was that this success hadn’t occurred at the NBA level. Instead, this occurred at a relatively small school called Butler University in Indianapolis, Indiana. Interesting. One of the most storied professional sports franchises decided to invest in their future by bringing aboard a rookie NBA coach with a grand total of six years of head coaching experience. Congrats, Danny Ainge, on hiring Brad Stevens. He has the demeanor of a composed leader. Hope he’s got the hide of a rhino for NBA grind. Outside of those from the Butler community (who were obviously well aware of Stevens’ coaching ability), many were shocked by the hire. Was Stevens really the best choice for such a high-profile job? Well, the embedded tweet from the “Zen Master” did a decent job at silencing the early doubters out there. Last time I checked, Jackson was a pretty darn good coach, so when he talks, people tend to listen. Stevens’ deal with the Celtics is reportedly six years, $22 million–or roughly $3.7 million per season. 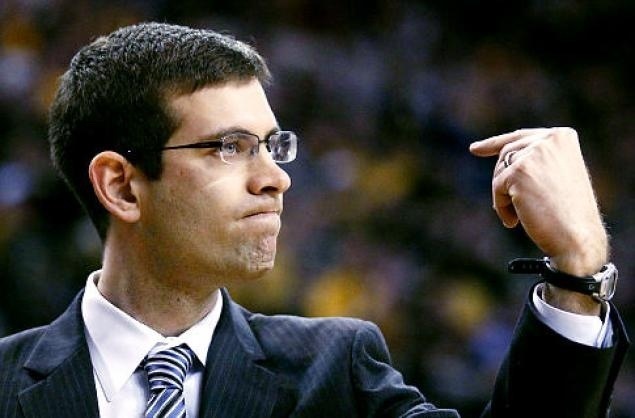 At Butler, Stevens made somewhere around $1.1 million per season. Though his deal with Boston is very likely back-loaded and possibly incentive-laden, let’s take the average of $3.7 million per season and run some quick numbers and provide a brief scenario. It would have taken Stevens roughly three and a half seasons at Butler to make what he made with the Celtics this season. To put it another way, his freshman recruits would have been preparing for graduation (assuming they stayed all four years, of course) by the time Stevens made what he made this season. Thus, it is economically understandable for Stevens to have left when he did. From a coaching career standpoint, the move made perfect sense as well. This wasn’t the lowly Charlotte Bobcats calling. This was the 17-time World Champion Boston Celtics calling. The Celtics are one of the top five sports franchises in the United States, if not the world. What made the job even better? The immediate expectations were low, and the team president, Danny Ainge, publicly vowed over and over that he was committed to Stevens’ plans for the long-haul. Sounds like a dream job, doesn’t it? Well, the 2013-2014 season was anything but a dream for Stevens and the Boston Celtics in terms of on-court performance. Despite a somewhat surprising start that peaked at a buzzer-beating victory over the Miami Heat, the season was a forgettable one for the Celtics–finishing 25-57 and 13 games back from the final playoff spot. Despite having the fifth-worst record in the NBA and the fact that the team finished in the middle of the pack in terms of attendance, Ainge remains committed to Stevens and his vision, for now at least. Before I get too far into hypothetical-speak, let me make something very clear: I am very confident in the coaching ability of Brad Stevens, and I fully believe he will bring championship-contending success back to the Boston Celtics. This, of course, can only occur if he is provided with a better roster than the one he had this season. The fact that he mustered 25 wins out of this year’s “NBA” roster is already no small feat for the rookie head coach. However, hypothetically speaking, let’s say the Celtics miss the playoffs again next season. At the same time, let’s say an established NBA head coach becomes available and Ainge, succumbing to the pressure of one of the most intense fan bases in the country, severs ties with Stevens to bring in a more proven coach. Let me reiterate: this is completely hypothetical, but with the pressure to win in the Boston area, especially given the sustained success of the Red Sox, Patriots, and Bruins, I don’t think the possibility is too farfetched at all. If not next year, what about the year after? Or the year after that? 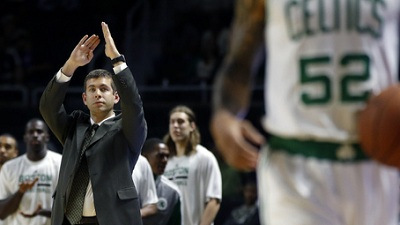 Thus, what would the future hold for Brad Stevens after his NBA experience with the Celtics? Depending on the timing, hundreds of NCAA head coaching jobs would immediately become available to him. At the top of the list would be schools such as Duke, Indiana, Kansas, and North Carolina just to name a few. UNC or KU? Roy Williams is 63, but you wouldn’t know that by how fast he paces up and down the court during games. Bill Self has a long way to go in his career (just 51 years old), but after disappointing, early-round exits in recent NCAA Tournaments, despite having premium NBA talent (Joel Embiid, Andrew Wiggins), how safe is his job? Especially if Stevens becomes available. Well, I will argue: Why not return to Butler? Yep, you read that correctly: why not return to Butler? There is absolutely no way to sugarcoat this past season. It was one of the worst for Butler basketball in recent memory. The team finished 14-17–good enough for 9th in the ten-team conference. 9th place out of ten teams. This wasn’t the big, bad Big East, either. This Big East was beatable from top to bottom, and yet, the Bulldogs managed just four wins in 18 chances. Three of Stevens’ last four Butler recruits (Berry, Brown, Castro) have decided to transfer, despite some of them likely guaranteed quality minutes next season. Three other players (two on scholarship) have decided to transfer as well. Butler athletics officials won’t publicly say it, but the program under Brandon Miller is in a state of flux right now–both on the court and off the court. Defense, a Butler staple, was non-existent at times during the 2013-2014 season. Off the court, the amount of team rules that were broken had to be a new record for the program. Would this have happened under Stevens? I’d venture a guess by saying a resounding “no.” The move to the Big East was a bold one and no one said it was going to be easy, but this past season didn’t instill much confidence into the Butler basketball community. Despite numerous dark clouds hovering over the program’s future, there have been some bright spots as well. Miller landed pretty highly-regarded recruits, Kelan Martin and Tyler Wideman (but what about Trevon Blueitt or possibly Trey Lyles?). Former McDonald’s All-American Tyler Lewis has transferred to Butler and will be available for two years starting with the 2015-2016 season. Former IU guard Austin Etherington will be eligible immediately. Finally, and probably most importantly, Hinkle Fieldhouse is getting much-needed renovations to bring its facilities up to par for its student-athletes and its fans. Stevens has his dream job right now with the Celtics, but if that opportunity is taken from him as early as next season, how could he pass up the opportunity of returning to a new and improved “home”? Sure, Stevens would have to take a substantial pay cut to come back “home,” but the money hasn’t stopped him before. Back in 2000, he had a well-paying job at Eli Lilly and Company when he left for an unpaid assistant coaching position at Butler, and that was before he had at least $10 million already in his pocket. Stevens always said he couldn’t leave Butler for another university, and at this point, this is still true. Though his stance has likely changed given his current situation, he could still prove this to be true. Brad Stevens left for the Boston Celtics. Rotnei Clarke and Andrew Smith graduated. Roosevelt Jones, one of the team’s top returning players, went down with a season-ending wrist injury in the team’s very first pre-season game in Australia. To top it all off, Brandon Miller (’03) was called upon to fill the void left by a legend and to lead the Bulldogs in their first season in the highly-regarded Big East Conference, without any prior head coaching experience. Wrong. Alright, I understand that it is only six games into the 2013-2014 season, but the Bulldogs have competed well against some tough opponents (Vanderbilt, Washington State, #5 Oklahoma State) and currently sit at 5-1 before their third-place tilt in the Old Spice Classic with the 4-2 LSU Tigers. Prior to the season, Athletic Director, Barry Collier, and the players stressed the importance of hiring a “Butler guy” to take over the head coaching position after Coach Stevens left for Boston. Why? To preserve the Butler Way, and who was better for the job than former Butler point guard, Brandon Miller? In his time with the Bulldogs, Miller was an integral component of putting Butler on the so-called “college basketball map.” In his first season (his sophomore season since he played at Southwest Missouri State as a freshman) with the Dawgs, he led them to their first NCAA tournament victory in almost 40 years. In his senior season, he led the team to its first Sweet 16 appearance since 1962 after upsetting #5 Mississippi State and #4 Louisville. For his career, he averaged 11.6 points and 3.1 assists per game for the Dawgs, but more impressively, he was a member of the conference’s All-Academic team each year. He knew the importance of the term “student-athlete” at Butler University. In short, he embraced the Butler Way–both on and off the court. Humility, passion, unity, servanthood, and thankfulness are the five characteristics that make up the foundation of the Butler Way, and through six games, this is a perfect representation of this team. Coming into the season, the media talked more about who was not coming back for Butler this season than who was going to be here. They completely discredited the current roster and doubted the ability of a first-time head coach in the Big East. Well, through six games, six players are averaging at least 5.5 points per game. From what I have seen so far, it appears that in any given game, a new player is capable of stepping up on offense–a staple of Butler teams over the years. Don’t get me wrong, though, the team does have some offensive superstars, Kellen Dunham (17.3 PPG)/Khyle Marshall (16.8 PPG), that will help shoulder a lot of the scoring load this season. Some of the freshmen, namely Andrew Chrabascz and Elijah Brown, will play key roles as well. By the end of the season, I wouldn’t be surprised if 10 guys played significant minutes each game. Thus, it appears to be a typical Butler roster. Will this team set scoring records? Nope. Will they produce NBA lottery picks like Marcus Smart of Oklahoma State? Probably not. Will they win games? You bet they will. The players know their roles. When they signed on to play at Butler, they knew a “recipe for success” was already in place, and it was their job to follow the instructions. Their job to embrace the Butler Way like countless players had done before them. This performance by Butler shows you can’t discount the Bulldogs in the Big East without Roosevelt Jones. Capable of beating anyone. You’re right, Mr. Rothstein. you can’t discount the Dawgs. In the Big East preseason coaches’ poll, these Dawgs were ranked ninth. Ninth. Out of ten teams. Yet, with wins over Vanderbilt, and Washington State, and a heart-breaking, nail-biting loss to Oklahoma State, it looks like they might have slightly underestimated Butler. What a surprise, right? I will be honest. Though it will be considered a “good loss” and one that the team can build on for the rest of the season, it was still especially tough. I have witnessed two NCAA Finals losses firsthand, but this one burned deep. Down by one, with two free throws and a little over eight seconds left, the Dawgs had a chance to, at the very least, tie the game with one possession left. Unfortunately, senior leader, Khyle Marshall, missed both shots and the team lost. In short, don’t discount the Dawgs this season. For more Butler and St. Louis Cardinals updates, follow me on Twitter: @stlCupofJoe or Facebook: stlCupofJoe’s Sports Page. Boston Celtics Hire Brad Stevens, Ronald Nored; Hope to Sign Gordon Hayward? Photo Credit: Associated Press/Mark J. By NBA standards, the Celtics were old last season. When star point guard, Rajon Rondo, went down with a torn ACL, most fans in Boston realized that it was time. It was time to move forward and start the rebuilding process of one of the most storied NBA franchises ever. Long-time Celtics, Kevin Garnett and Paul Pierce, were either going to retire or needed to be traded in hopes of bringing in a haul of draft picks to help with the rebuilding process. That is exactly what the Celtics did, but let’s break it down, step-by-step, to see exactly what happened in Boston this summer. After Doc Rivers was sent to Los Angeles to coach the Clippers in exchange for a first-round draft pick, the Boston Celtics officially started “rebuild mode.” Well, on July 3rd, Danny Ainge implemented step one of the rebuilding process by hiring one of the most successful college coaches, Brad Stevens out of Butler University. Stevens, a fresh face in the NBA, hopes to bring his strong basketball IQ to Boston and have a much more successful NBA career than his predecessors, Rick Pitino and John Calipari. Thus, the Celtics got their man as head coach, but that was just step one of many moves that needed to be made this off-season. Little did he know that less than a month later, he would be employed by Boston Celtics. On July 9th, it was announced that Cannon was following Coach Stevens and joining the Celtics staff. 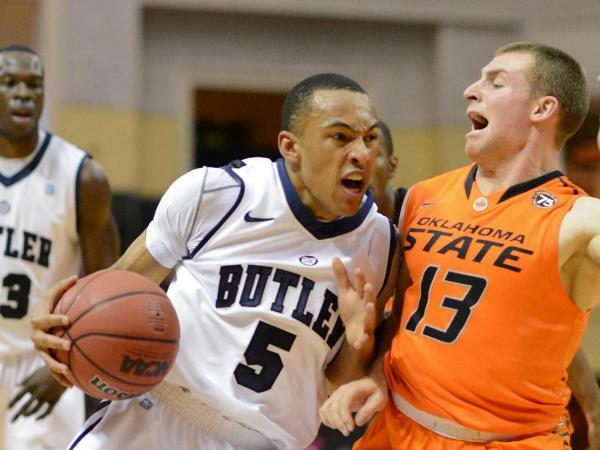 This past season, Cannon, just 23 years old, sat on the bench for the Butler Bulldogs. Before the game, during the game, and after the game, Cannon used mathematical equations and analyzed numbers to help break down what was happening on the court for the Bulldogs. According to Stevens, Cannon was an “invaluable resource” for Butler–using in-depth research to help with starting lineups and player substitutions throughout the game. This season, Cannon will be doing much of the same, but it will be on a much bigger stage. On July 12th, the Celtics officially completed the blockbuster trade that sent Garnett, Pierce, Jason Terry, and DJ White to the Brooklyn Nets. In exchange, the Celtics received five players, three first-round draft picks (2014, 2016, 2018), the right to swap first-round picks in 2017, and a trade exception worth nearly $10 million. Thus, the roster underwent a drastic overhaul with MarShon Brooks being the most important player coming to the Celtics. The reason for the trade was to get younger, clear salary, and get draft picks for the team to utilize in the future. A little over two weeks after the trade, it was made official that Coach Stevens was adding another Butler person to his Celtics staff. This person was one of his prized recruits in 2008. This person was the team’s point guard and best defender while at Butler, and he played an integral role in helping the Bulldogs reach back-to-back National title games. This person, by now you already know, is Ronald Nored. Stevens will use Nored in the player development role for the Celtics. One of his main responsibilities will be developing players on the Celtics NBA Development League team, the Maine Red Claws. Thus, if you include the hiring of Micah Shrewsberry, Coach Stevens has now surrounded himself with three Butler assistants. Four Butler guys in Boston is nice and all, but why not add one more to the mix next summer as well? The Celtics just may have that opportunity next July when a budding NBA star officially becomes a free agent. In 2010, the Utah Jazz drafted Gordon Hayward with the ninth overall pick in the NBA Draft. At the time, he was primarily known for this last second shot against the Duke Blue Devils in the 2010 NCAA Tournament title game. What most NBA fans did not know was that he was actually a highly skilled small forward with the capability of scoring from all areas on the court. Also, given his 6’8″ athletic frame, he is fully capable of guarding just about anybody–from shooting guards all the way up to power forwards. Used primarily as the team’s sixth man in his rookie season, Hayward averaged just 5.4 points and 1.9 rebounds per game. However, he has played a more integral role over the past two seasons–averaging around 30 minutes per game. Last year was Hayward’s best year yet–averaging 14.1 points, 3.1 rebounds, and 3.0 assists per game. If you still are not convinced by Hayward’s ability at the NBA level, you may find it helpful to watch these highlights of his 22-point game against Kobe Bryant and the Los Angeles Lakers from a couple seasons ago. 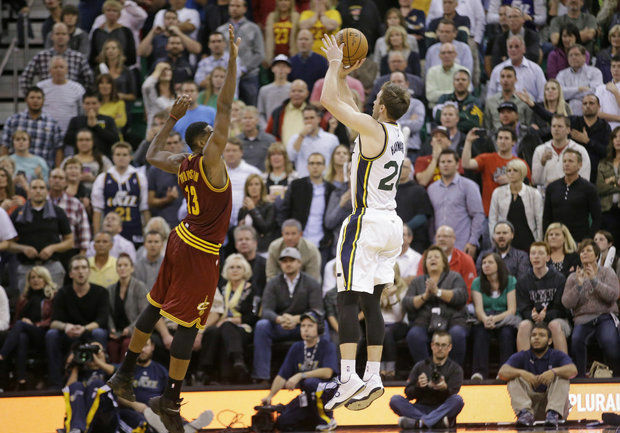 Well, Hayward is in the final year of his rookie contract with the Utah Jazz. Thus, his future with the team is unclear. Based on what the front office has said about him, it is obvious that they want to bring him back to Utah via a long-term contract. However, based on the moves being made in Boston this summer, this may be just a little bit more difficult than they originally would have thought. Coach Stevens is considered one of the most influential figures in Hayward’s basketball career, and Nored was in his same recruiting class in 2008. Thus, will these two hires by the Celtics be enough to convince Hayward to leave Utah for Boston? This is still to be determined, but the Celtics are definitely making all the right moves at this point. Even if Hayward chooses to stay in Utah or signs with a team not named the Celtics, it is still nice to see that Stevens is surrounding himself with Butler people. Nored and Cannon will not only help Stevens be successful as the Boston head coach, but they will also help expand the Butler University brand as well. In an 82-game season plus pre-season and possibly playoffs, I bet that announcers and analysts will bring up Butler, their NCAA Tournament runs, and the proverbial “Butler Way” thousands of times, if not more. Thus, as I wrote in my previous Butler article, Coach Stevens gave so much to the University from 2000 through June 2013. Based on the man that he is, it is only fitting for him to continue helping Butler, even when he is exactly 950 miles away. 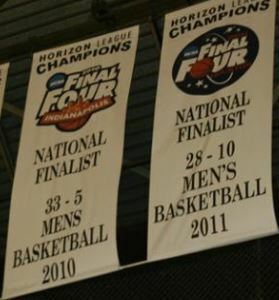 Stevens was able to get two banners raised in his time as head coach at Butler (shown below). Let’s hope he can go one step further and get one of the champions variety–the 18th NBA Championship for the Boston Celtics. I want to brief this post by saying I have been a fan of the Butler Bulldogs since 2001–the year my sister started pharmacy school there. I have remained an avid fan, and I am now in my 5th year of pharmacy school at Butler University, myself. Thus, I am not some national media member trying to make sense of the move. I am just writing about the coach that I have come to know over the years. Thank you for leaving a high-paying position at Eli Lilly and Company to become a volunteer basketball assistant at Butler in 2000. Thank you for leading the Bulldogs to an incredible 166-49 record during your 6-year tenure as head coach. Thank you for always having a perfectly drawn-up inbounds play after a timeout. As a past player and a fan of the game being played the right way, it was an honor watching the magic you were able to come up with when it mattered most. It was truly a pleasure watching a basketball mastermind at work. Thank you for leading all of us on two magical journeys through the NCAA Tournament to back-to-back Final Fours during my freshman and sophomore years at Butler. Thank you for turning down job offer after job offer to remain at Butler over the past six years–from Oregon to Illinois to UCLA. Lastly, on a more personal level, thank you, Brad, for sitting down with me freshman year–allowing me to interview you for over an hour on your coaching philosophy for a class I was merely taking as an elective. Class, in every sense of the word, is what Brad stood for at Butler. The day of the National Championship in Indianapolis, I had a class with one of the players, Zach Hahn, and where was he? He was in class–on the same day as the biggest game in Butler sports history. Why? Because Butler players are at school to get a degree, not just to play basketball. Brad made sure players never forgot that. Brad was much more than a basketball coach. He was the face of everything that Butler stands for–the face of the Butler Way. Butler lost some tough games in his six years at Butler–including two national championships and most recently a heartbreaking round of 32 loss to Marquette. No matter the loss, no matter the call by the ref, Brad handled it with class. Sure, he may have been unhappy with numerous calls and had trouble dealing with losses, but he never disrespected the officials or the opponents. Butler, now entering the Big East Conference, is probably in its best situation since it’s founding 158 years ago. Mr. Stevens is one of the main reasons for this. Thus, I cannot be mad at Brad. He was given a once-in-a-lifetime opportunity to be the head coach of one of the most storied NBA franchises ever, the Boston Celtics. Who in their right mind would pass up an opportunity like this? Unfortunately, history is most definitely against Brad being successful in the NBA, but let’s be honest, when has that stopped him before? He led Butler to the National Championship two years in a row when most “experts” had them losing in the first round. Top college coaches like Rick Pitino and John Calipari were unsuccessful in the NBA, but as someone who has followed Stevens closely the past four years, I am not doubting him. He may have a tough first season, but once he grooms his players to “buy in” to his system, the rest of the NBA better watch out. 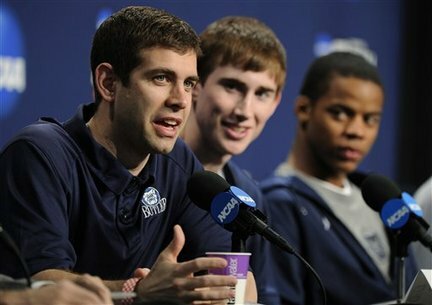 As Butler great, Ronald Nored, said via Twitter, “I learned a long time ago, that whatever Brad Stevens says or does. Trust it.” Thus, I trust him, and I hope all other Butler fans will trust him as well. After all, he did not leave for another school that he thought was better than Butler, he left for a dream job in the NBA. He is not turning his back on Butler, he is just taking the next step needed in his coaching career. Thus, thank you, Brad, for everything you gave to Butler University. You will most definitely be missed.